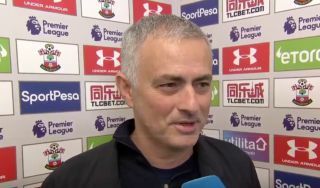 Jose Mourinho revealed his reasoning behind starting midfield duo Scott McTominay and Nemanja Matic as centre backs in Man United’s match against Southampton on Saturday evening. United deployed what seemed to be a 3-5-2 against the Saints on Saturday, with both Matic and McTominay filling in at centre-back alongside Phil Jones. He then revealed that injuries to Chris Smalling and Eric Bailly was why they weren’t available, and that Marcos Rojo only trained for the first time on Friday, thus the Argentine was only selected for the subs bench. Mourinho also stated that Victor Lindelof also has an injury, and that’s why he wasn’t part of United’s squad for Saturday’s clash. Mourinho’s decision to start both Matic and McTominay at the back was surprising, especially when you consider that fact that he left Rojo on the bench, as both are primarily midfielders, and it would’ve surely made more sense to start a defender in the middle of defence instead. "I would like to have Nemanja Vidi? but no Vidi?, only Nemanja Mati?…"